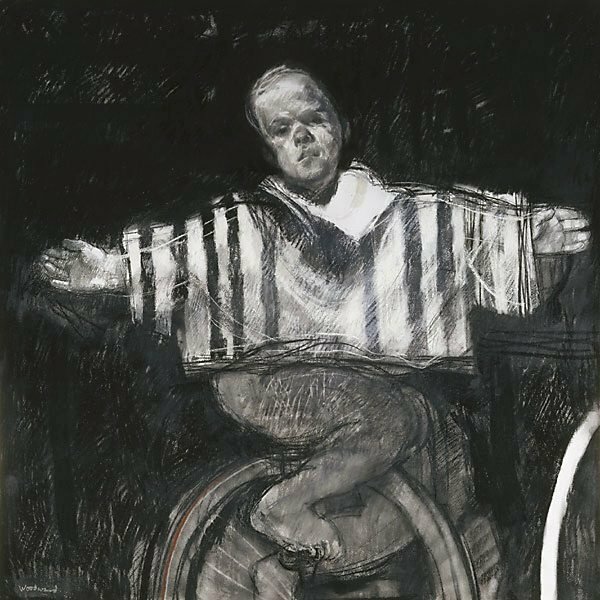 The central character of the drawing 'Francisco Lescano riding the unicycle' is taken from a Velazquez painting. This work was a finalist in the 2001 Dobell Prize and was acquired by the Gallery in 2001. Signed l.l., white pastel "Woodward.". Signed u.r. verso on canvas backing, black pastel "MARGARET WOODWARD./ ...". Dated u.l. verso on canvas backing, black pastel ".../ ... (2000)/ ...".